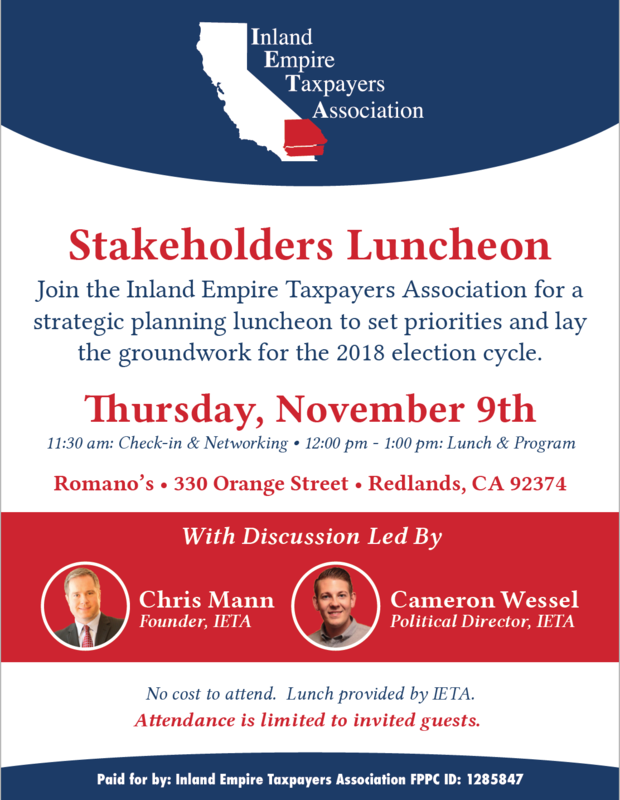 The Inland Empire Taxpayers Association is already busy planning for the 2018 election cycle! "When you wake up in the morning and drink that first cup of coffee, you pay a sales tax. When you start your car, you pay an automobile tax. Drive to work, you pay a gas tax. At work, you pay an income tax – and a payroll tax. You get home at night, and you pay a property tax. Flip on the light – you're paying an electricity tax. Turn on the TV – you pay a cable tax. Make a telephone call, you pay a utility tax. Brush your teeth, you'll pay a water tax. Even when you die, you pay a death tax. We are an overtaxed nation and hardworking Americans deserve a break."